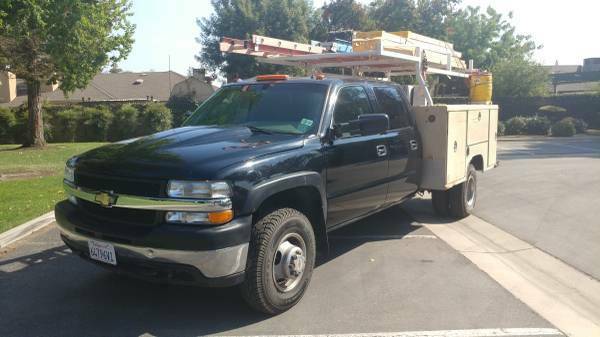 2001 Chevy Silverado Crew Cab Diesel 4x4 Dually Long bed removed for service utility body- I do not have ut anymore. Long Bed Dually Royal Service Bed 4x8 sheet of plywood will fit in. 2 new batteries 5 yr A-1 Batteries 05-2016 New ABS Module 2016 212K 6 New tires less 3k miles K and N Style Filter System AC blows cold. 53.9 degrees from vent Power windows Power door locks. 212,500 miles aprox Registration was valid thru 06-30-17. It is currently on a non-op so there are no penalties to register. Selling because I work for a company now and then provided a company vehicle. 07-2016 $5500+ in work at Performance Diesel Bakersfield on injectors, oil pump, fuel pump. Area above headlight dinged. Replaced both headlights and marker lights since picture taken. It looked funny having 1 new headlight (old one got cracked) Old camper jack stand fell on it Dvd player Worn leather seats you may want to or replace but they are useable also. Full power driver seat works. Not using. Have job. Just sitting. Started and run eveey few weeks/driven at times. ***Orange Rigid job box gangbox not included*** Email link in "reply"